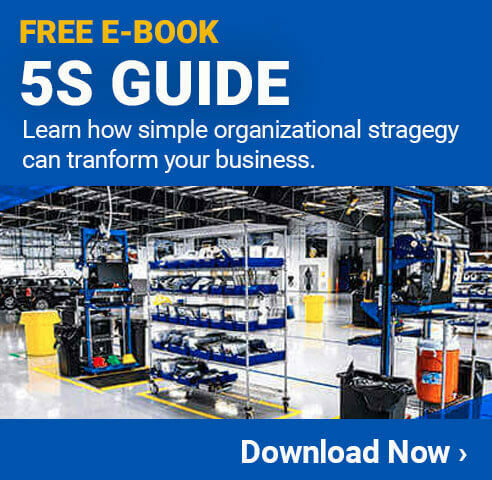 Once an organization determines the 5S strategies are a good fit for the company, they need to start planning out how to implement 5S. Proper implementation will require physical changes to the facility, as well as training employees and other parties to operate in accordance with the 5S methodology. It can take quite some time before 5S is fully implemented, but there will be significant benefits throughout the implementation process. Before even beginning the implementation process, it is important to understand what 5S is. 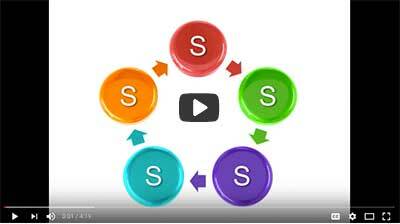 The following video explains what 5S is and how it can help a facility. Sort - Eliminating any obstacles that get in the way of production. Remove any unneeded items, put things away, and make sure the right people are performing the right jobs. 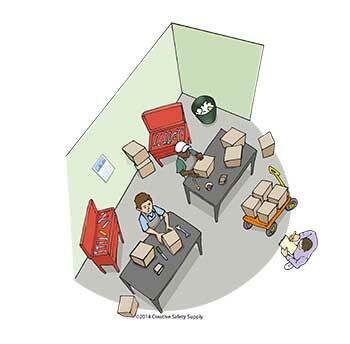 Set in Order - Arrange things so that they are located where they need to be used. Reducing or eliminating the need for employees to walk to another area to get a tool will help prevent wasted time and effort. Shine - Clean workplaces are much more efficient than dirty ones. In addition, clean tools and machines last longer and cause fewer issues during operation. Standardize - Setting standards for how work should be done will reduce errors and improve efficiency. While standards can be improved upon, having everyone operating in the same way will help increase production. Sustain - Make sure any improvements implemented will be effective long into the future. Performing audits and inspections can help sustain the improvements gained through the other four steps. Senior Management - Having buy-in from the upper-level management teams is essential. While they typically won't have an active role, they are needed for approving changes and bringing all the groups together. Middle Management - Depending on the size of the organization, middle management should also be included in the implementation team. They will take a more direct role in helping to coordinate what types of improvements need to be made in the areas they have direct responsibility for. Direct Supervisors - The front-line supervisor will be the one responsible for making the bulk of the changes and making sure that the new strategies are followed. Having direct supervisors as a part of the implementation team can help ensure they support the 5S changes and will work hard for the success of the project. Front-Line Employees - The front-line employees will be the ones to directly "feel"the changes, so it is important to have them on the team. They will be able to point out improvement opportunities and help address potential problems that management may not be aware of. Since the 5S team is made up of people from every level of the company, it is important that they know how to work together. Keeping everyone in the loop on all decisions and making sure to value the input that people give (regardless of their level) is essential to the success of 5S implementation. The total number of people on an implementation team can range from 4 to about 12 in most cases. With larger teams, some of the members won't have as direct a role, but instead act as advisors or resources to the rest of the group. Once a team is put together, the next step is to establish a base line of how things are done in the facility. This process will help come up with ideas for where improvements can come from and make it possible to measure the success of the 5S implementation once it has been completed. One of the best ways to gather information prior to the actual implementation of 5S is to go out to the shop floor. This can be done in a variety of ways, one of the most popular of which is known as Gemba, or a Gemba walk. Gemba is a Japanese term that translates to "the real place"and is used in manufacturing and other industries to have supervisors and managers spend time on the actual shop floor. Another term for this is "management by walking around"and it has been proven very effective. By spending time where the work is done, people will more likely be presented with real problems that can be evaluated for real solutions. Momentum - Any time a new project is starting, it is important to build momentum. Starting with multiple small and simple issues that can be dealt with right away will show everyone that the 5S implementation is not only happening, but it is benefiting the facility. Practice - Whenever starting something new, it is a good idea to try simple things to begin with so people learn how the project will go. It is much easier to address problems on smaller and easier projects than it is on a major issue. Eliminate Waste - No matter how easy an issue is to solve, addressing it using 5S will help reduce waste in the facility. This is a great way to eliminate some type of waste right away. There are many examples of 5S projects that can be chosen as part of the initial implementation. The following are some options to consider. Floor markings have proven to be one of the most effective ways to improve safety and increase efficiency within a facility. There are many ways these types of markings can be used to benefit the facility, all of which will reduce or eliminate some type of waste. 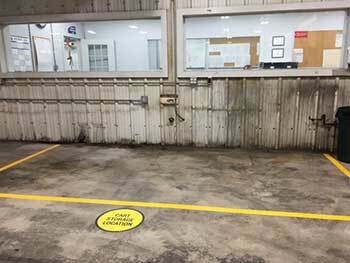 Floor marking tape can be used to mark off aisle ways so drivers of high-lows and other vehicles know how close to the edge they are at any given time. Arrows can be used to indicate which way traffic should flow so other vehicles don't get in the way or cause an accident. Floor marking tape and floor marking symbols can also identify emergency exits, the routes of production, and much more. Since this type of floor marking is inexpensive and effective, it is a good option for 5S. Safety signs offer many of the same benefits that floor markings do, but they are up at eye height rather than on the floor. These signs can warn people in an area of moving machines, vehicle traffic, or any number of other things. Many facilities also use these signs to identify different steps in the production process. This ensures everyone knows where the production of a product begins, how it proceeds through the facility, and where it will end. 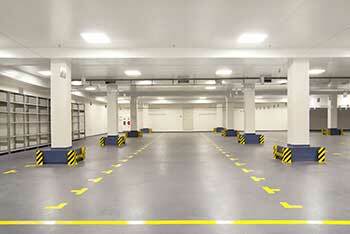 One of the most popular types of 5S project is organizing an area of the facility. Keeping things organized helps ensure things can be found quickly and easily. It also helps eliminate wasted time and energy for employees who would otherwise have to go out and search for the items they are looking for. Tool Organizers - Options like pegboards and shadow boards make sure every tool in a shop has a set place. Employees will know exactly where to go to find what they need and where it needs to be put when they have finished the task. Parking Labels - Identifying where particular vehicles should be parked when not in use will help ensure they are there when needed. For electric vehicles, this can also ensure they are being charged when not in use so they are always ready to go. Using floor marking tape is a great way to facilitate this type of organization. Drawer Labels - When items are kept in drawers or cabinets, having them labeled from the outside is an effective way to speed up the process of getting what is needed. Rather than having to pull out each drawer and look through, employees can just locate the one that contains what they need and look there. Relocating Machines - Depending on the size of the facility and the machines in use, this can be a significant project, but it may be worth the effort. Moving machines around so production flows from one machine to the next with as little wasted motion as possible is a great way to reduce waste. As the initial projects are completed, it is important to always be planning what can be done next. In fact, having a list of projects that need to be done can be a great part of the implementation process of 5S. Once everyone in a facility understands what 5S is and what types of waste to watch out for, it can be very helpful to have a system where employees can submit recommendations for 5S projects. It is almost always the front-line employees that can identify waste in the facility most easily. Working with them will ensure there are always things that can be done and will also help the facility eliminate the worst areas of waste first.